Spiky obsession: Trust in the plan. Before starting the garden, we sat down and did a design, which we got friends to comment on. Thank you Mel and Darran. Since then it has been converting the paper plan into reality. 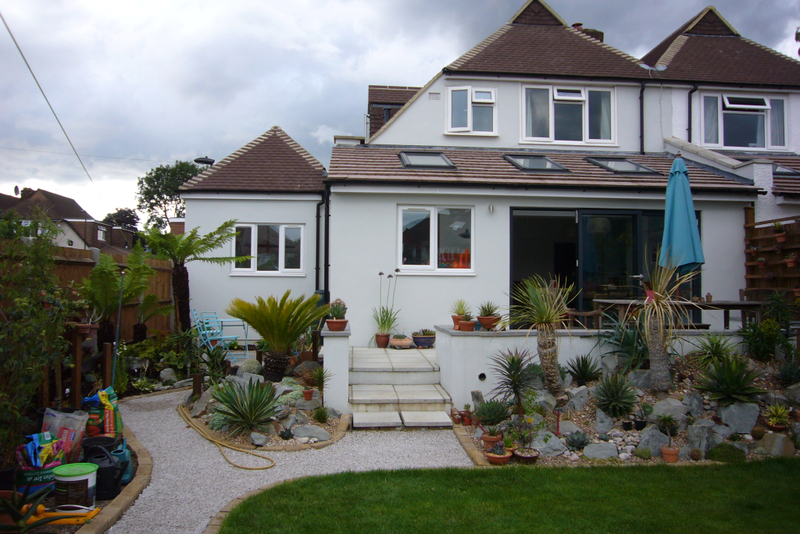 In a recent post (found here), I showed the cycad rockery. 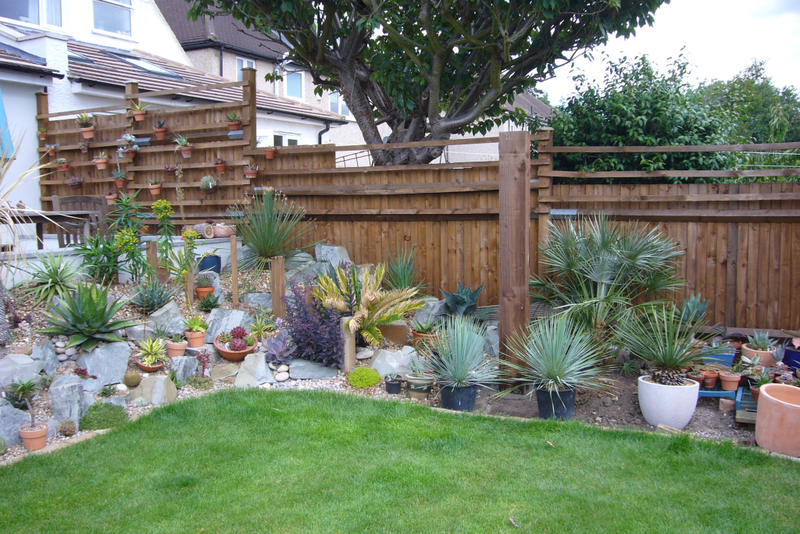 This and the main succulent rockery haven't changed much. 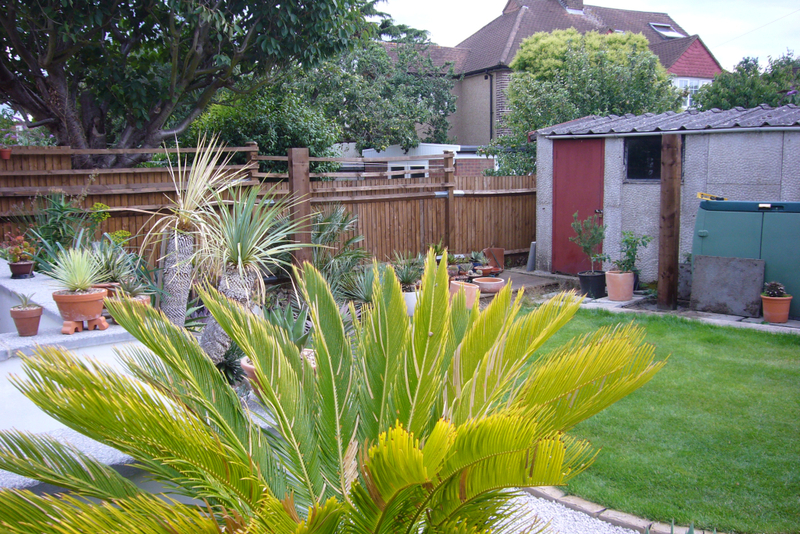 The odd plant has been added and things have grown, some quicker than others. But it was quite easy to move these sections from design to reality. This year the work has been in the other parts of the garden, moving through the rest of the plan. In the side section we are trying to create more shade. The whole garden is in full sun pretty much all day. With the exception of a little bit of shade along on the fence, the first real shade is created by the house at around 3pm. The tree ferns and planting along the fence will ultimately create more shade, even in their first year they have done well. It is not quite enough for the under-planting though and I think we will end up putting a shade sail over that section at least for the first few years. It would also make a nice feature for when we have friends around. The other end of the garden is more problematic. At some point the garage will be knocked down and replaced, but we can't afford to do it at the moment. The greenhouse will also be moving at that point. As the design revolves around these larger changes, it can result in things looking at bit strange at the moment; like the path ending at the greenhouse not at the gate. No doubt the design will evolve as all gardens do, but I have to trust the main aspect will work. The latest project is one of those times to trust everything will work out. I want to continue the planting from the end of the main succulent rockery. 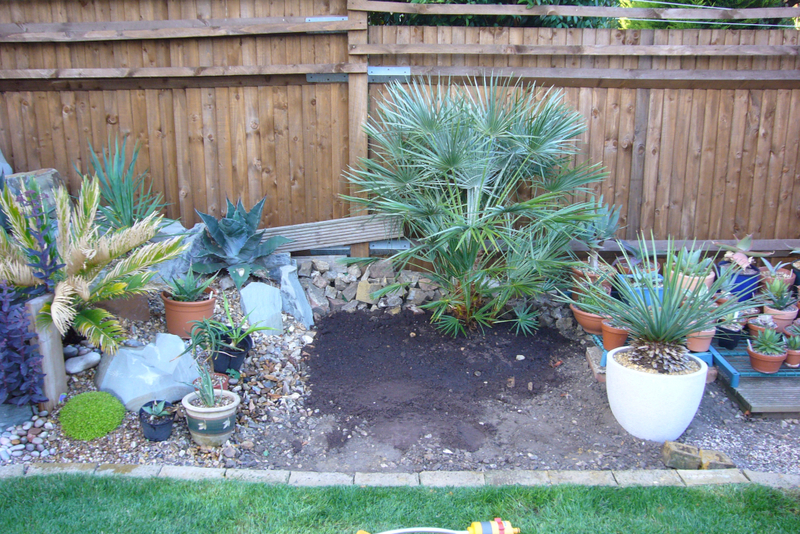 The first bit was easy, plant the chamaerops humilis. Next up the hammock posts. Ultimately there will be 4 railway sleepers used as posts for our hammocks. We don't want to wait for years until the garage is moved to be able to use the hammocks. So yesterday two of the posts turned up. The first was simple, going next to the new chamerops. It was surprisingly quick to dig the hole and concrete it in. Now it's there I can plant around it. The second sleeper will ultimately be in a border where the garage currently is. I know where it is suppose to go and what the area should ultimately look like. As most of the bed does not exist yet and can not be set out, it was a simple case of trusting the plans. You see, looks a bit strange at the moment. I find myself saying, it will work, trust in the plan. I just hope it's true. The plan has worked beautifully so far! Looking forward to seeing how it evolves over time. Thank you. I am quite curious myself to see how much I change it when the garage finally get smoved and I can use the full space.